In 1910 they coined the term “Readi-Cut” and by 1915, in addition to small cottages, they offered farm outbuildings such as barns and henhouses, and eventually interior furnishings such as cabinetry and appliances. The small cottages soon grew into large scale houses and Aladdin was so successful because they offered a style for everyone in all price ranges. They sold Dutch, English, and Georgian style Colonial houses, California and Stickley bungalow styles, and variations of all of the above. 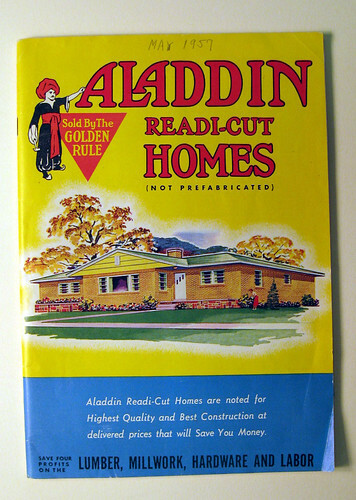 A few years later, North American Construction had grown into a million dollar business, owned their own lumber mills, and were calling their products Aladdin Readi-Cut (not pre-fabricated). Note the inclusion and emphasis of the word not pre-fabricated in parentheses of their name! You do it yourself! During the early 20th century the Radford Architectural Company, Sears, and other Michigan firms, Liberty, Sterling, and others were competing with Aladdin in the do-it-yourself housing market. These catalogues are valued and interesting because of their creative graphic design, and how they show the evolution of interior and exterior 20th century home design. What’s more interesting is back then, they thought Aladdin was a white guy with a robe! Thanks for this article. It’s really neat to see how the DIY mentality evolved over the years. This is something that organizations like Habitat for Humanity could use. I wonder why we don’t see more companies like this nowadays. Great article and the house looks really cool for the time frame. I love seeing these old advertisement. Reminds me of the Sears advertisements for there ready made homes. All though it doesn’t seem like much has changed, it really has. In the early days I believe a person could build a DIY home, but I don’t believe that anymore. It is still possible but very hard. I have looked into it. Most state and local laws now require the person building the home to have a general contractors license. Otherwise I believe you would still see a lot of that type of advertising for homes. More and more regulations take away the fun things to do. Just like riding a bike when you were a kid without a helmet. Nowadays every kid has a helmet on. Oh well, I guess that’s what you call progress. Not sure if it’s good or bad. As an earlier commenter stated, not much has changed. I’d have to agree. the technology etc. has certainly come along way since then, but prefabbed home concept has been virtually unchanged.